More than 120 aftershocks have shaken the northeast coast of Taiwan and more are expected since a magnitude-7.1 earthquake hit the island yesterday afternoon. Today, two of these aftershocks, of magnitudes 4.8 and 4.5, hit eastern Taiwan, triggering landslides. They were both centered at sea off the coast of Ilan, a town southeast of Taipei. 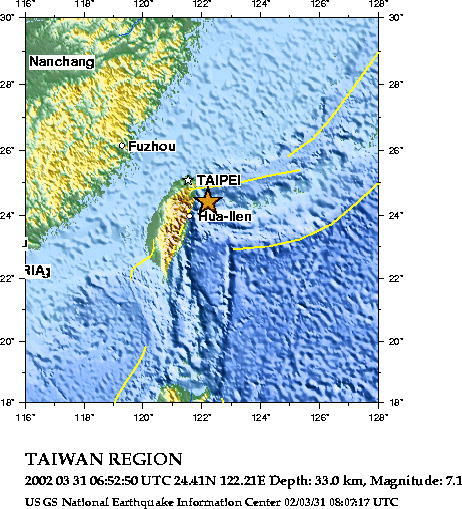 Yesterday's earthquake, measured by Taiwan's Central Weather Bureau to be a more modest magnitude of 6.8, originated near Hualien, about 108 miles east of Taipei. Five people died when two cranes fell from the 60th floor of a high-rise builiding constuction site, according to media reports. At least 200 others are injured. This is Taiwan's largest earthquake since 1999 when more than 2,400 people were killed and 11,000 injured in a magnitude-7.6 earthquake. The Taiwan quake is the fourth temblor of magnitude 7.0 or higher on the Richter scale this year. Taiwan is part of a seismically active stretch of the Pacific basin where earthquakes can occur frequently.